What’s Left: 287 Days. 72 Bands. Expectations: Well obviously I think this is going to be incredible, since I booked him for this show. A little nervous, though, since his album was recorded with a full band and tonight he’s playing a solo show. Concert: I had been waiting for this day for months. To say I was waiting patiently or calmly would be a complete lie. I was freaking out. This was my first live event with the blog, I was in charge of the booking and the marketing/promoting…basically it was on me to make this a fun night. I was petrified. But Wesley Wolfe showed up right on time for the sound check, calm and composed, looking excited to be playing for Sunset in the Rearview’s event. His act was first, and unfortunately the crowd hadn’t really gotten going yet. Many more people were still to come and the ones who were there were still hovering in the back of the (large) room by the bar. Wesley didn’t seem to mind, though. He played his solo act incredibly, using loops and admitting when he didn’t think something was done well enough. So what did he do? He started the song over, being sure to please the crowd who came out on a rainy night to see him perform. That right there is what I call dedication from an artist. It may seem an embarrassing act in the eyes of an artist, but to fans like me, I think that’s a sign that they really want their sound to be perfect for you and they’re devoted to the crowd’s acceptance. Wesley Wolfe was accepted very well by the crowds. His vocals were perfect; incredibly smooth, just like what was recorded on his album. His demeanor was great – he was engulfed in the mood of his music. His ability to create a full sound as a solo act was perhaps most impressive. It was just Wesley and his guitar, but he was able to record his sounds and loop them, including banging on his guitar to create drum sounds. If my eyes had been closed, I never would have guessed that it was one man standing on stage. Concert Afterglow: I couldn’t be happier that Wesley was the first opener of the night. He has so much talent that needs to be heard by locals. What an incredible performance, despite the lack of a crowd near him on the stage. Recommendation: You may not have the opportunity in the near future to see Wesley perform if you live outside of North Carolina. If that’s the case, buy his album. It’s incredible. If you are living in NC, go see him perform. He’s fantastic. Sunset Live Tonight! 8:00 at Motorco, Durham! Hope to see plenty of yall at Motorco Music Hall (723 Rigsbee Avenue) tonight for the first ever Sunset in the Rearview live event! It’s a party…in the form of a concert…featuring Jon Lindsay, Bright Young Things, and Wesley Wolfe. Come out and have some beers in celebration of Sunset in the Rearview’s 2nd birthday and enjoy some GREAT music! Comments Off on Sunset Live Tonight! 8:00 at Motorco, Durham! Sunset in the Rearview’s 2 year celebration is less than a week away, and I couldn’t be more excited. To get y’all on my level, here’s a sample of the three performers. Enjoy! ANNOUNCEMENT: Full Lineup for Sunset Live! The time has come! 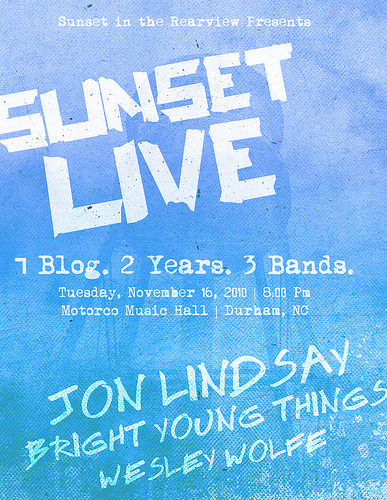 I am announcing the third band involved in Sunset Live, a celebration of Sunset in the Rearview’s 2nd year featuring three hit North Carolina bands. Before I do that, though, let me just remind you all of the details. To add to our current lineup of Bright Young Things and Jon Lindsay, we have WESLEY WOLFE, an indie singer/songwriter hailing from Carrboro, NC! 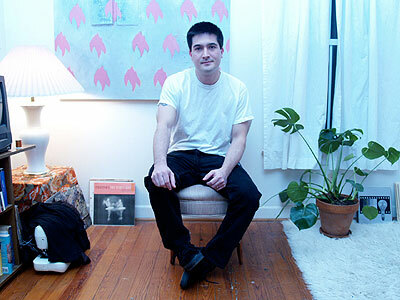 Wesley has released two albums through Odessa Records, both of which showcase his raw, acoustic talent and incredible power with words. Comments Off on ANNOUNCEMENT: Full Lineup for Sunset Live!